Toronto Maple Leafs’ general manager Kyle Dubas learned the hard way just how difficult contract negotiations can be when he had to endure the William Nylander saga last year. Dubas and Nylander eventually agreed to terms just before the December 1st NHL deadline arrived and he’s been taking heat from some Leafs’ fans ever since. Dubas didn’t want to struggle through the same process with star center Auston Matthews and announced on Feb. 5th that the 2016 first-overall draft pick has inked a new five-year deal. The native of San Roman, California was scheduled to become a restricted free agent on July 1st, but is now under contract for the next five seasons after signing a $58.17 million deal. The contract will take up $11.634 million worth of salary-cap space per season until the end of 2023/24. The 21-year-old Matthews had 23 goals and 23 assists in 38 games this season at the time of the signing and is generally regarded as one of the top-10 performers in the NHL. He’ll be the second-highest paid player in the NHL next season behind Edmonton Oilers‘ captain Connor McDavid who makes an average of $12.5 million a year. The Leafs could have signed Matthews to a maximum of eight years, but with the team still having to ink several other free agents the parties agreed on a shorter five-year term. This is reportedly to help Dubas manage the club’s long-term salary cap obligations while others feel Matthews doesn’t want to commit to the team for that long. He’ll still only be 26 when the contract expires and will then be eligible for unrestricted free agency. Matthews will actually receive 93 per cent of the contract or $54.5 million, in bonuses and this could be an area of concern for NHL Commissioner Gary Bettman and franchise owners. The young man has posted 97 goals and 81 assists for 178 points in his 182 regular-season games since breaking into the league in 2016/17. He’s ranked second in goals-per-game average since then behind Washington Capitals’ sniper Alexander Ovechkin. 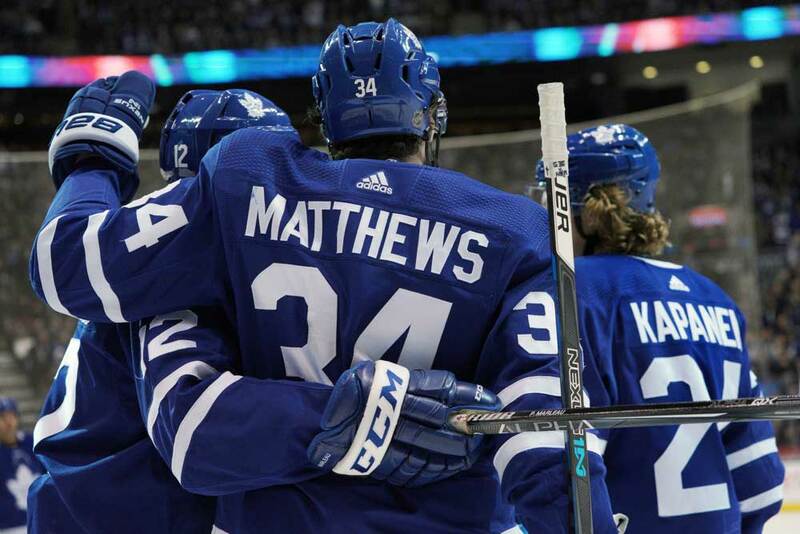 As a rookie, Matthews posted 40 goals and 29 assists in 82 games and followed up with 34 goals and 29 assists in 62 outings as a sophomire. At just over 18 minutes of ice time per game under head coach Mike Babcock, Matthews plays considerably less than some of his peers. He’s produced at a high level in the regular season, but has been labeled disappointing in the playoffs by some fans with five goals and two assists in 13 postseason contests. He’s also come under fire by some quarters for being injury prone. Matthews missed 20 games last season with a few different ailments and has also missed 14 contests this campaign. It’s been suggested by many fans and hockey commentators that Matthews would one day like to play in Arizona, where he grew up. Those rumors certainly won’t subside with the length of his contract being just five years. Dubas still has a lot of work ahead of him as Mitch Marner is also due to become as restricted free agent in the summer along with fellow winger Kasperi Kapanen. Defenseman Jake Gardiner will be an unrestricted free agent at the same time. But the recent acquisition of blue liner Jake Muzzin from the Los Angeles Kings may mean Gardiner will be dealt before the Feb. 25th trade deadline or be allowed to walk as a free agent. Marner’s situation isn’t as clear since he’s publicly stated he doesn’t want to enter contract negotiations until the season is over. Dubas would like to sign him as soon as possible before other teams are eligible to present the player with an offer sheet. It’s debatable who’s more valuable to the team, Matthews or Marner, but Dubas may find Marner’s agent will ask for the same money as Matthews. Marner has currently appeared in 211 games in a Leafs uniform and has contributed 61 goals and 132 assists for 193 points and has added three goals and 10 assists in 13. playoff games. Marner has scored at a .91-points-per-game pace in the NHL while Matthews is at .98-points-per game. Babcock may be jumping the gun though as Marner’s agent Darren Ferris could play hard ball and ask for more money than Matthews. He could also hold off signing a new deal to see if any offer sheets come the player’s way. With the Leafs being so close to the salary cap it’s conceivable they wouldn’t be able to match an offer without shedding another player’s salary. This would especially be true if the team’s other free agents sign new deals before Marner. The Maple Leafs have witnessed the problems that can arise when NHL teams can’t keep everybody happy under the salary-cap system. The Chicago Blackhawks were a prime example, but they still managed to keep their core of Jonathan Toews, Patrick Kane and Duncan Keith together. The big difference is those players all earned their big contracts by winning three Stanley Cups whereas the Leafs have failed to navigate past the first round of the playoffs since 2004. Maybe this year that might just change?